Among the #vanishingcommonarts is the art of writing. 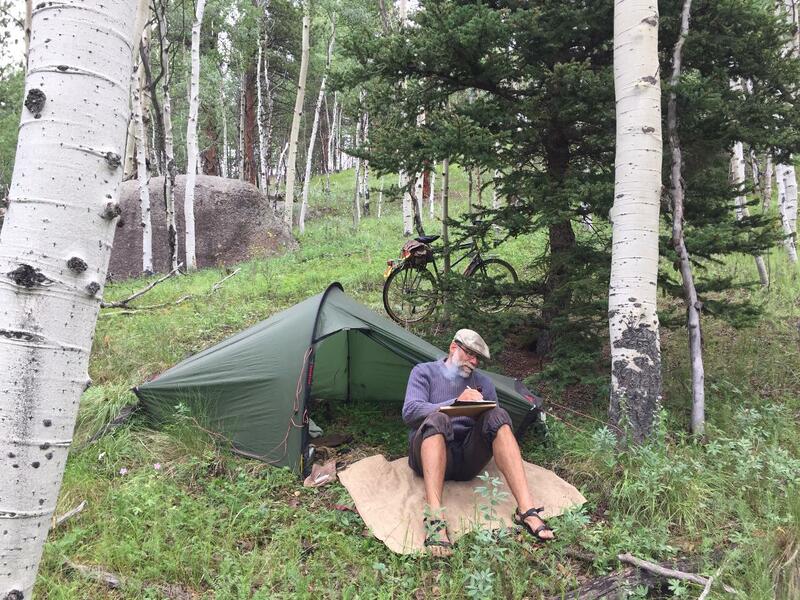 Not jotting notes in a journal ... real, thoughtful writing in flowing, elegant longhand. The kind of writing that, when read, promotes thought, because flow of thought occurred as it was being written. Sitting down after reading quality writing that led to quality thinking and needs to be written and takes hours if not days of hours to catch up. Why is Writing a Vanishing Common Art? Quality reading and writing is not taught in schools. Exposure to the best writers humanity has produced is outmoded. What is taught? Typing is. Print is. Both are staccato. Both. Truncate. Thought. Into. Staccato. Ideas that flow, one into another, and build, one upon the other, in an intricate, solid developing wonder to crescendo to an idea wonderful beyond the sum of its parts ... these ideas happen in minds trained to flow their thought rather than truncate it. We are in a poverty of staccato thinking. Here is a screen shot from the 2017 film “Mary Shelley,” about the author of Frankenstein, depecting her unsustainable clutching of the primary tool of her craft. Absurd. Tip of the hat to Pencil Revolution for the screen shots. 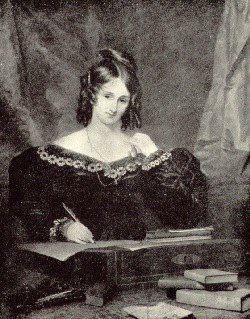 By way of comparison, a photograph of Mary Shelley at her writing desk, holding a quill, shows the same way of holding a writing instrument shown in all classic art, including of scribes going back millennia. How Mary Shelley actually held the primary tool of her craft. Elegant. Solid. Flowing. Strong. Gentle. 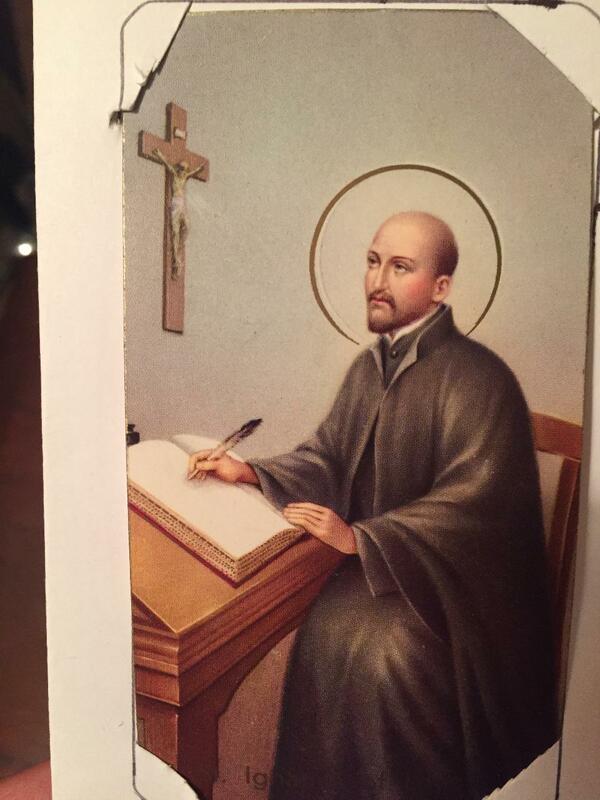 This holy card shows Saint Ignatius holding his quill at work at a tilted writing slope, another secret to writing right. 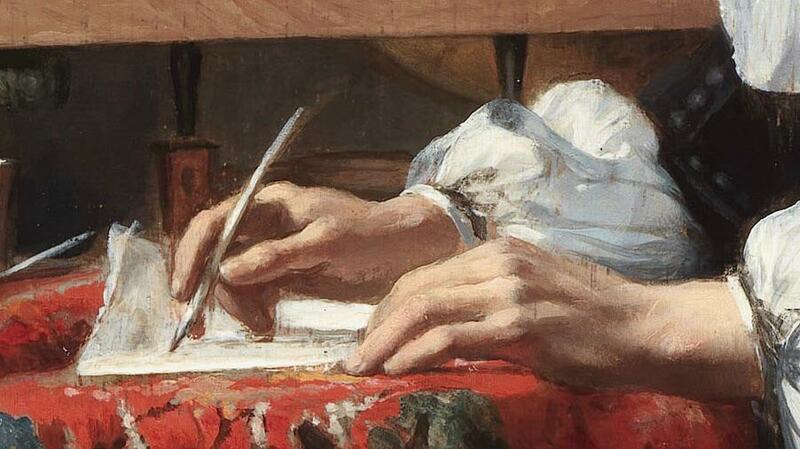 Every photo or art I've seen from before 1900 shows a similar way of holding the pencil. Why? Because this is how they were held by those for whom writing was the primary means of communication across distances, who wrote for hours at a time, day upon day. I made the shift a few years ago. It was not easy, but the simplicity astonished me. Instead of struggling to write more than fifteen minutes at a time, I could write for hour upon hour. Combined with switching to writing longhand (cursive), my flow of thought dramatically improved. I’m hardly the paragon of best thinking, but I've been told the difference is easily seen by comparing my first novel, written by keyboard, and my second novel, written pencil to paper in cursive. The pencil should feel light in your hand, almost like a sixth finger. It won't at first, but will become so with experience. Hold it. Do not clutch or grip it. Hold it further back. This gives you leverage for greater movement with less exertion. Far enough back to get leverage, no so far it is uncomfortable to write. Yes, I know, this is uncomfortable to write for the first 30 hours. I mean after that, after you've acclimated. Guide with the pencil between and parallel to your index (pointer) finger and your middle finger. Cradle the pencil gently in place with your thumb. At first you will need to resist your thumbs urge to slide forward. This may persist longer than you'd like. Resist the persist. Grin. 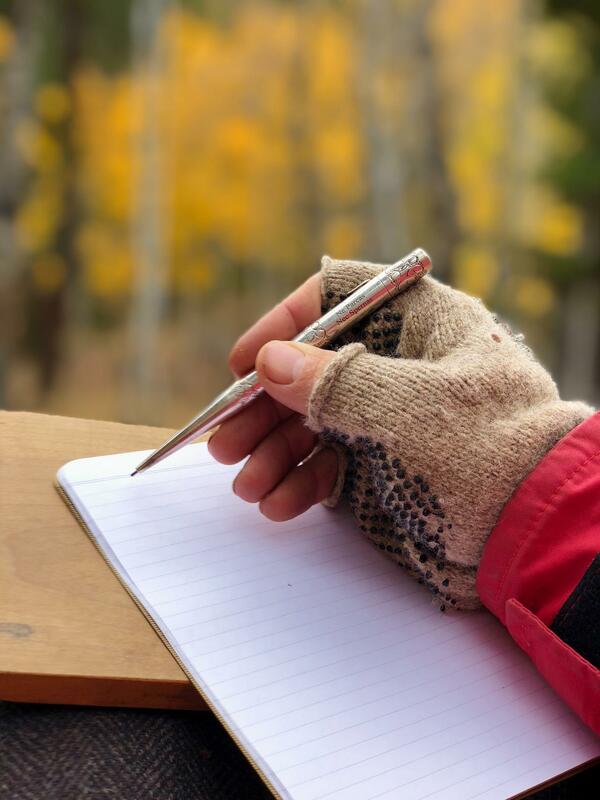 The back of the pencil should gently rest on the third bone of your index finger, NOT in the fleshy part of your hand between your thumb and index finger. There are a number of good, likely older systems of writing cursive online and in book form. Pick one and make it your own. Cursive is essential to flow of thought to occur. You will be a better writer for it, even when you write emails or other bits on directly on the keyboard. Why? Your brain works differently because of writing cursive, not just when you write in cursive, but at all other times as well. Quality matters here. Experiment with what works for you, but I despise pens for their blots and skipping. Pencils, with quality, smooth lead, are brilliant. Woodcased Japanese pencils or the Blackwing 602 are my preference, followed closely by Yard-o-Led silver pencils. 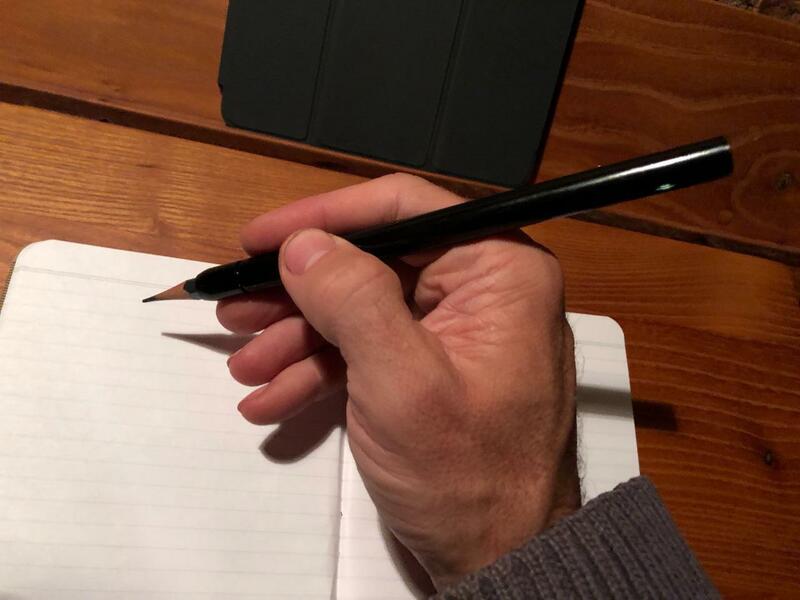 Paper is heavier, with subtle lines that do not scream out, but are just barely there to guide my hand so my writing stays straight. A woodcase pencil in a Pencil+ pencil holder prototype, giving it the diameter and heft of a Yard-o-Led silver pencil, but, and I’m being amazingly nitpicky here as the difference between them is nearly non-existant, with a smoother lead and without the very slight play in the tip. Keep the pencil tip roughly 1mm in diameter, and rotate the pencil as needed to keep an edge. Sharpen to a slight concave, elongated tip with a knife (practice makes perfect here), or an El Casco pencil sharpener (yes, they are pricy, as quality craftsmanship is. Well worth it, in my experience). We can't do better than actual sun actually outdoors. Short of that, the closer to sunlight the spectrum of the bulb is, the better. At the time of this writing, that eliminates all but a few incandescent bulbs. 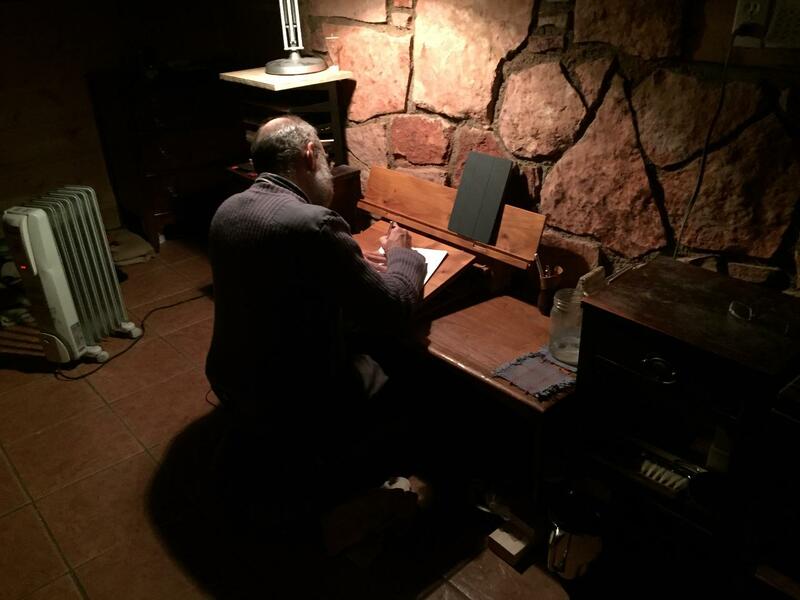 A tilted writing desk is essential.